Although the world of marketing and public relations is constantly changing, a media kit is still an important aspect of working with the media. Media kits (sometimes called press kits) consist of promotional materials that are shared with the media to promote a product, company, or in our case – a destination. From attending media shows and working with journalists and editors, we know what information the media is looking for. Media kits for travel PR offer additional facts, stories, and images that help the media determine if a destination is a fit for their publication. A media kit can come in different formats – thumb drives to pass out at a media event, hard copies to hand out at a desk side, or an online press room on your destination’s website. 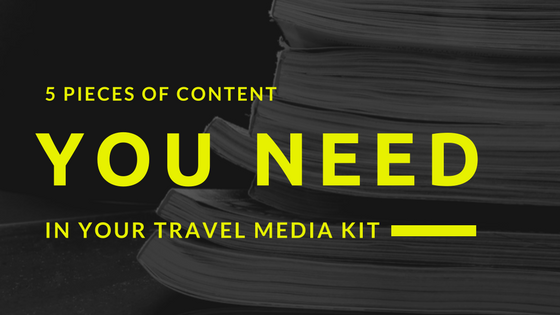 No matter the format you choose, there are five pieces of content you should include in your media kit for travel PR. Include an overview or one-sheet about your destination. Provide a description of the area and include some of the top attractions, accommodations, and places to eat. Link to your website and social media channels. Your writing should be descriptive enough to give the media a mental image of your destination. But we’ve heard it time and time before: a picture is worth a 1,000 words. Include a folder or link to a website (such as Dropbox or Zenfolio) with high-resolution images that show off your destination. If available, include video or b-roll footage as well! Keep in mind, these should be items that would be okay if the media used them in their press coverage. Story starters are creative prompts for the media, helping to spark an idea on how to cover your destination. Think outside of the box – consider various angles that appeal to different target audiences. The Haunted History Trail’s story starters speak to travel writers, food and beverage writers, and even architecture publications. Include collateral that helps tell your destination’s story. This could be your creative travel guide, a trail passport with information about each stop, or a map of your destination’s best assets. If it’s informative and pretty to look at, it should be included. This may seem like a silly one, but it’s very important (and easy to forget) to include contact information. There are plenty of scenarios where media may end up with your thumb drive but not your business card. Or an editor ends up on your destination’s press page without knowing who to contact. Make it easy for them and include contact information in the kit, on printed handouts, and displayed on your website. Although not necessary, listing press releases or recent press coverage is also popular in online press rooms. Press releases share new developments and give additional story ideas. Recent articles show what other writers have published which could build credibility for your destination if a big publication recently visited, or could help writers envision what their angle would be.